Habanero chilli (bombai morich) goes very well with this dish. If you are lucky enough to have one, add chopped chilli in the end. 1. Roast moong dal on slow heat until lentil is crisp. But be careful we don’t want to burn it. And soak in water 15 minutes. Then drain the water. 2. Heat the pan with oil and add sliced onion. Fry it till it becomes golden brown. 3. Add ginger, garlic, chilli powder, turmeric, coriander powder bay leaf, cinnamon, cardamom, clove and 1 tablespoon salt. Cook it till oil is separated and chicken pieces. 4. 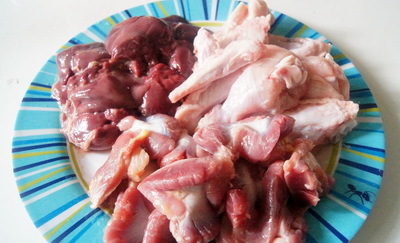 Cook the chicken pieces till it becomes half cooked and stir occionally. 5. Add lentil and 5 cups of water and cook it till lentil is tender. 6. Check the salt and add sliced green chillies, cumin powder and coriander leaves. After 2 minutes remove from heat. 7. 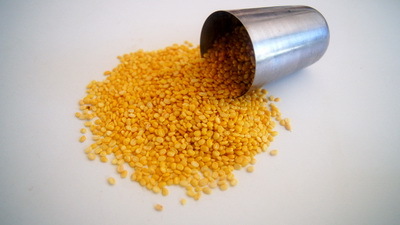 Serve moong dal with chicken pieces with plain rice/ polau/ naan or paratha and enjoy the flavour of lentil. This is very good variation, in Lucknow there is Murg Mashoor, were “Mushuri Dal” is used. You can suggest this to be done in rice cooker , very nice flavor. Thanks. Love your word about Persi and mushuri dal(red lentil). I love to know about food from different culture and enjoy the similarity between these. I like your recipes too much .But need to learn more which is easy and can done with available things.Hope you clear my point.Thanks for your nice and fine recipes. Hi! 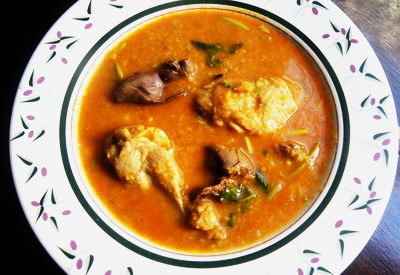 I try to keep recipe simple and use regular ingredients in Bangladeshi kitchen. But living overseas may effect on some of my recipes. Hope you will understand that and if you let know about substitute, I love to help you .Thanks. I think this recipe is SO simple compare to other recipes for South Asian food I have seen. They are so complex, with so many spices and layers of flavors. I really appreciated this recipe! We are making it for a Nutrition in World Cultures class. I’m not sure about you Afrina, but there are a lot of Indian and other Asian markets in my area so I am confident I will have access to these ingredients! You can get lucky at Whole Foods and other similar grocers as well. It is my pleasure that you like it. Simplicity is beauty , noone can beat it.